Millennium Ark: China Event Signals Earth Changes? Karen Lyster is a friend of ours living in New Zealand. We met her when Stan was lecturing in Auckland last year. She is a very level-headed, insightful woman, not one guided by sensationalism. She sent the following messages which are certainly eye-opening. Before you read them, let us share a little information about the Maori. Every country has its "original people". For America it is the Native Americans, for Australia it is the Aboriginals, for New Zealand it is the Maori. What do these people all have in common? They are spiritually gifted, closely knit people who generally keep to themselves, share their tribal prophesies with very few outsiders and generally lead simpler lives closely tied to the Earth. Due to the times in which we live, that being very close to major Earth changes, some have been willing to share their information. Regardless that these three groups of people are thousands of miles distant from each other, their prophesies are remarkably similar. Yesterday, I was visited by a lady who is an Elder of one of the Maori Tribes. Even though she's probably only about 45, she's a decendent from the Royal Bloodline of the Maori Queen. She has what is called, great "Mana", and although there isn't an english translation for the word, it really means that the person has to have great wisdom, earned INCREDIBLE respect, and has abilities like inner visions and intuition. So if you equate her to one the Hopi Elders, you can see what I mean about her presence. Now, she told me that a few weeks ago she was "called" to go and visit Cape Riangi - which is the furthest most point of the North Island here in New Zealand. She tried getting there three times; but had car trouble and other obstacles "put" in her way; so she returned home back. But again, she was told to go there; and, this time, the "fire in her belly" (as she put it) was far too strong to ignore. She thought it best if she go by bus tour to make sure she got there! Now, when the bus arrived, there was a lighthouse which most of the other tourists went to look at; but, she was drawn to go out to the farthest most point of the Cape... literally the "tip top" of the North Island. She said she stood on the cliff face and closed her eyes,... letting the cool breezes brush her face. Then, when she opened her eyes, she was looking at a totally different landscape. The sea was completely gone; and there was land as far as her eyes could see. She said it seemed to go on forever. She also felt as it the land itself had "lifted" much higher than it had been previously. After taking it all in, she once again closed her eyes; then opened them once again; and the scene was back to normal. I asked her if the whole of New Zealand would go under the sea before coming back up again; and she held out her hand and made a rolling and twisting motion, saying that, unfortunately, most of the country would go under; but some areas would stay above water. Now, before she left, she gave me a big hug and told me that tomorrow morning I would wake up to the news that a dike in China had collapsed killing 100's of people. I woke up this morning at 8am; turned on the radio; and that's exactly what was being said. But, I've tried to find it on the news wires here on the net, and can't find it anywhere!! Very preplexing to me, as I KNOW I heard it. She was one very unique lady to say the least. And I knew you'd be interested in what she had to say. Well, first of all, I was just visited again by that Maori Indian Elder Woman who wanted all the data printed out from both your website and Jim Berkland's,... including maps etc.....- so, she left here loaded up to the eyeballs with printed matter to take back to the other Elders for them to study. I was amazed that she even knew of both of you; because the Maori keep VERY much to themselves; and where they live, they have no phone, no TV, no radio, no video etc etc etc... To be quite frank with you, Stan, I got the disinct impression that it was YOU that I was supposed to pass the information onto about what she'd seen and what would happen to New Zealand. It was quite a shock having someone of her stature turning up at my doorstep! That's why she gave me the prediction before she left about the dikes busting in China and killing 100's of people..... and of course it happened exactly as she had said,... - even her saying I'd be waking up and hearing it on the news at precisely 8am (I'm certain this was to prove what she'd told me on other things were true). She said that she's been told that Lake Taupo would "blow" (her words); and, she added, she could take me to nearby places where there were valleys that would be filled with 100's and 100's of bodies just floating there after Taupo blows. Then, she went on with her other explanations of how the whole of New Zealand would be effected with all the twisting and turning it would have to endure (not a pretty thought!). Of course, I asked her when all this would happen and - just like the Hopis - she said "soon, very soon"... but she did go a little further than that. However, I was taking so much in from her, I only hope I can tell you correctly what was explained to me. She said that there would be an event that was unrelated; but when this event happened, it would be a trigger for many major earth changes.... Again, this was to be in China; and it's a subject I know nothing about; so, please bear with me on this one. She said there was this "channel" there in China that they'd been working on for many years; and it was not yet complete. She said work had stopped on it for various reasons; then she told me that up above this "channel", there were 1000's of logs or timber that were perched at the top of this "channel"... Furthermore, over time, some had been stolen; but most were still there (she didn't say what they were to be used for, so it's a bit confusing for me). She said that soon these logs would come crashing down killing 1000's; and, when this happened, it would be a sign for her people that these Earth changes were about to happen with great intensity. Does any of this make sense to you? Do you know of any such "channel" being built by the chinese? She said it had been started many years ago but never completed. Anyway, I'm really glad you replied, Stan; because, as I said, I got the distinct impression that it was you that they really wanted this information to be passed onto. The alarm clock was a simple thing and yet what I saw in the dream had depth in my sub-conscious that I could not remember until now... good grief!.... good grief!... 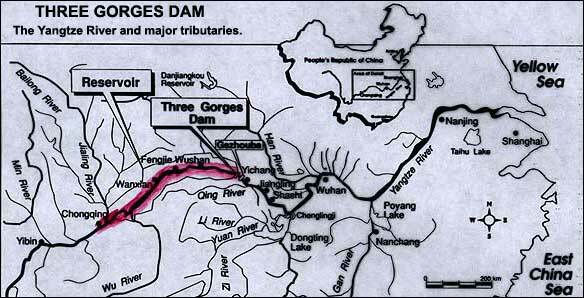 We have heaps of data on Three Gorges Dam project... maybe the Maori's info has been sent to tell us that the time is near because my chinese, red, alarm clock was the only thing I would need??? There have been consistent rumours that the 185-metre high dam, which entails the removal of entire villages to higher ground, is being shoddily constructed, amid reports of endemic corruption in the project. But the China Daily report represents an unusually frank admission that the dam has serious shortcomings and some leaders are now critical of the project. It has been bedeviled by corruption. 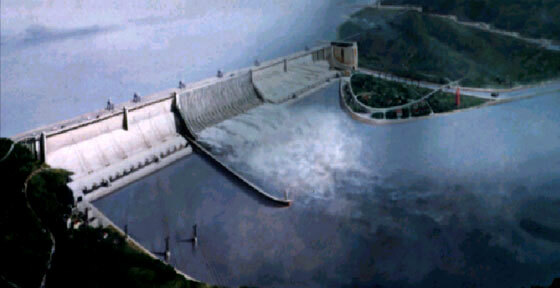 In 2000, 97 officials were convicted of embezzlement from the dam fund. Activists have criticised the enforced resettlement of those whose homes lay in the 600km-long (300 mile) area which will form the Three Gorges reservoir and the loss of many historic buildings and artefacts that will be drowned.